The Animas River during the height of the Gold King Mine spill (La Plata County photo). RealVail.com over the years has delved deeply into the lasting impacts of hard-rock mining in and around Colorado’s mountain-resort communities, including the EPA Superfund site near the headwaters of the Eagle River known as the Eagle Mine. From the abandoned toxic ghost town of Gilman to Bolts Lake and the tailings pile near Minturn, the Vail Valley has an immediate and very glaring example of what lucrative mining operations from centuries past can do to our landscape and water quality – both key factors in our outdoor-recreation economy. The Gold King Mine, near the tourism and ski town of Silverton. 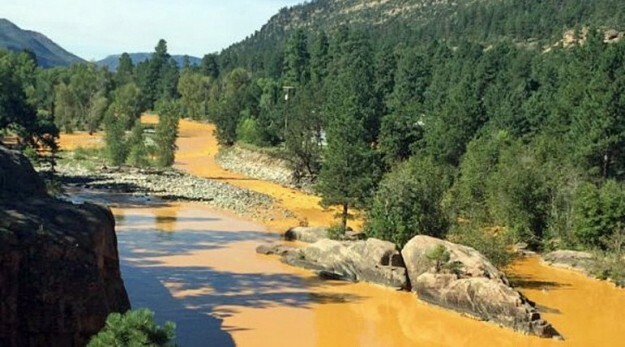 became the poster child for legacy mining messes in 2015 when contractors working for the EPA accidently released an orange flow of toxic mining sludge into the Animas River. Congress for years has been gridlocked on what to do about the thousands of old mines slowly – and sometimes quite rapidly – leaching into our mountain streams and rivers. The mining companies are often long gone and therefore absent in the cleanup process that then falls on taxpayers. Republicans and many modern mining companies favor “Good Samaritan” legislation that would let them partner with nonprofits and governments to go in and take care of problems created decades and decades ago when there was little to no regulation of mining operations. Not surprisingly, those modern companies – using presumably much more environmentally responsible technology – want to be absolved of legal liability and to be able to possibly extract more minerals in order to cover the costs of their cleanup operations. Democrats and environmental groups prefer a complete reform of the obviously antiquated 1872 Mining Act to require modern companies to pay into a fund for cleaning up past messes. Colorado Gov. Jared Polis on Friday signed a law sponsored by state Rep. Dylan Roberts, D-Avon, that will halt the practice of “self-bonding” that allows mining companies to provide their own financial assurances against future pollution. Companies will now have to post enough bonding with the state to clean up any future environmental disasters they create. How the law will impact re-mining or nonprofits engaging in so-called “Good Samaritan” cleanups of old legacy mining messes is unclear, but the theory is that future mining disasters like the Gold King in Silverton will no longer be left up to the taxpayers to deal with. However, it doesn’t deal with the issue of legacy mines all over the state leaking into water supplies. This week, Gov. Jared Polis signed Rep. Barbara McLachlan and Rep. Dylan Roberts’ bill to help prevent water pollution from future hard-rock mining operations in Colorado. Mining operations have polluted more than 1,600 miles of Colorado rivers and streams, and Colorado is one of just seven that allow “self-bonding,” which allows mines to operate with insufficient recoverable assets, leaving taxpayers vulnerable to potential cleanup costs. HB19-1113 will ensure that when new mining permits are issued, sufficient and secure bonds are in place to ensure cleanup and better protect public health and the environment. The new law will end self-bonding for hardrock mines in Colorado and will explicitly include water quality protection in the calculation for the amount of bonding required. It will also require mining license applicants to set an end date for the cleanup of their operation, so that they can no longer just to do water treatment into perpetuity. Numerous small business owners, rafting outfitters, farmers, local elected officials and others from across western and southern Colorado testified at a House hearing in support of the bill and it passed both the House and Senate with bipartisan support.